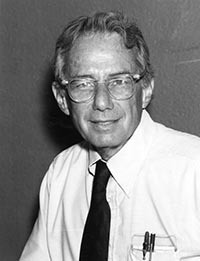 Arthur Rosenfeld was Professor Emeritus of Physics at University of California, Berkeley (1994-present). Other institutional affiliations included Lawrence Berkeley National Laboratory, United States Department of Energy, and State of California Energy Commission. His research interests included physics of elementary particles, energy policy and efficient uses of energy. June 22, 1926Birth, Birmingham (Ala.). 1944Obtained BS, Virginia Polytechnic University, Blacksburg (Va.). 1954Obtained PhD in Physics, University of Chicago, Chicago (Ill.). 1954 – 1955Research Associate, Institute of Nuclear Studies, University of Chicago. 1955 – 1994Research Associate (1955-1957); Researcher (1957-1964); Director, Particle Data Group (1964-1975); Leader, Particle Physics Research Group A (1971-1973); Leader, Energy-Efficient Buildings Research Program (1974-1986); and Director, Center for Building Science (1986-1994), Lawrence Berkeley National Laboratory, Berkeley (Calif.). 1957 – presentAssistant Professor to Professor of Physics (1957-1994) and Professor Emeritus of Physics (1994-present), University of California, Berkeley, Berkeley (Calif.). 1962 – 1965Member, Committee on Uses of Computers, National Research Council. 1963 – 1966Member, Panel on University Computing Facilities, National Science Foundation. 1967 – 1969Member, Subpanel B, High Energy Physics Advisory Panel, United States Atomic Energy Commission. 1969 – 1971Member, Physics Information Committee, American Institute of Physics. 1970 – 1972Member, Statistical Data Panel, Physics Survey Committee, National Research Council. 1978Visiting Professor, Collège de France. 1981 – 1983Chair, Board of Directors, American Council for an Energy Efficient Economy. 1984 – 1990President, American Council for an Energy Efficient Economy. 1988 – 1990Acting Director, California Institute for Energy Efficiency, University of California. 1990 – 1994Member, Board of Directors, American Council for an Energy Efficient Economy. 1992 – 1994Member, Board of Directors, International Institute for Energy Conservation. 1994 – 1999Senior Advisor to the Assistant Secretary for Energy Efficiency and Renewable Energy, United States Department of Energy, Washington (D.C.). 2000 – 2010Commissioner, State of California Energy Commission, Sacramento (Calif.). 2005Awarded Enrico Fermi Award, United States Department of Energy. 2008 – 2009Chair, Board of Directors, Federation of American Scientists. 2010Member, National Academy of Engineering. 2013Awarded National Medal of Technology and Innovation. Research advisor at Berkeley Radiation Laboratory and both employed at University of California, Berkeley. Advised by Fermi at University of Chicago on "Production of Charged Pions from Hydrogen and Carbon and Production of Pions in Nucleaon-nucleon Collision at Cyclotron Energies," and both employed at University of Chicago, Institute for Nuclear Studies. Advised by Rosenfeld at Lawrence Berkeley Laboratory. Both employed at University of Chicago, Institute for Nuclear Studies. Director, Particle Data Group; Leader, Particle Physics Research Group A; Leader, Energy-Efficient Buildings Research Program; and Director, Center for Building Science. Research Associate and Researcher (Berkeley campus). Senior Advisor to the Assistant Secretary for Energy Efficiency and Renewable Energy and received 2005 Enrico Fermi Award. President; Member and Chair, Board of Directors. Member, Committee on Uses of Computers and Member, Statistical Data Panel, Physics Survey Committee. Member, Panel on University Computing Facilities. Member, Subpanel B, High Energy Physics Advisory Panel. Acting Director, California Institute for Energy Efficiency. Proceedings [video recording] : talks presented at the Enrico Fermi Centennial celebration. 2001 September 29. Experimental meson spectroscopy--1972 (third Philadelphia conference). Editors: Arthur H. Rosenfeld and Kwan-Wu Lai. Meson spectroscopy; a collection of articles. Edited by Charles Baltay [and] Arthur H. Rosenfeld. Nuclear physics and the physics of fundamental particles; proceedings. Report edited by Jay Orear, A. H. Rosenfeld [and] R. A. Schluter.